I try to be protective of my soul and came up with the saying I say to myself “Don’t take it personally” and being a psychic medium I often know what others may say about me that’s insulting and not true and if people are this way in person saying words that scorn inside I’ve learned to try to let them go in one ear and out the other, to let it roll right off your back as the saying goes ” sticks and stones may break your stones but words may never hurt you”, not if you don’t let them. Knowing who you are and that what others might say is not so at all its best to not take it in to not damage your spirit and soul inside as “shielding your soul” to not let it bother you. 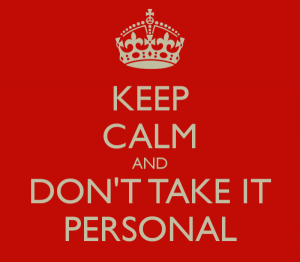 My new saying lately is “Don’t take it personally”. I am a person who does not like to feel upset as most do not, and letting unwarranted unwanted statements that are not true roll right off your back is best as there is no point to let it eat you upset inside when its not true at all and no point in taking it personally to upset you when it means nothing at all. I am sharing my new saying here ” Don’t take it personally” as many have relationship issues with others, saying things to them that are not so. People get very upset when they are accused of something they are not doing as it’s not who they are. Often in a relationship one will stay away for weeks if they are accused of doing something they have not done as they are so hurt and mad the person said it about them, such as accusing a very loyal person of seeing another person when they are not at all and never would, accusing them drives them away and makes them mad to no end, that they stay away for weeks often to cool down then the person who said something mean is so mad they have not called and its because they accused a person with good character of doing something wrong that they did not do and would never do is often why. Saying insulting words to people can harm their being and spirit inside which is why I try to wear a shield of armor around mine and often say “I’m not taking it personally” I’m not taking it in as its not so at all and I know that, being a good person who’s caring and forthright and sentimental is reason to gaurd your soul and to say ” I’m not taking it personally” I’m not taking that false statement in and letting it get to me, to eat me up inside and scorn my soul and spirit as its not so, its best to let it go, in one ear out the other, let it roll right off your back, let it go to the wind the wayside , don’t digest it and ” Don’t take it personally”. I worked hard on my soul clearing negative hurts of the past to feel open, free and light on my feet without being bogged down. I did this work in my 20′s and realized with time I don’t like being upset, so I learned how to detach from others who are negative with words and insulting statements that aren’t so at all, guarded I am as I am a sentimental person, an introverted poet as a child and I developed my higher intuition by working hard at it over the years since I was a kid to advance my spiritual gifts and to using them’ for good purpose in helping others I enjoy. Being psychic it’s difficult personally to know things you don’t want to know by readings, dreams and clairvoyant visions, people gossip, lie and say things that are not at all, so for a sentimental person I have a wall around my soul I’ve built as I don’t want to wound my soul. I worked to hard clearing it out in my 20′s and I am one to avoid people who make negative statements as I’m into affirmations, positive energy of the great white light and feeling good inside. It’s good to know who to trust and not trust by readings and many ask me this question about family members and work associates so they know who’s sincere with good intentions about their life and well being as some are not loyal and who may betray them. I do clairvoyant visions and ask who’s nice and who’s mean? Who has a halo on? walking around. Some people are born sincere and some are not advanced with good character and I’ve learned for myself “Don’t take it personally”. Also, when people say something mean, insulting, critical and negative to a person then they feel awful for saying it, and that causes guilt, shame, remorse, bad feelings about themselves. So being a good person, staying nice, sincere with good intentions you feel better about yourself, your soul and spirit and more uplifted inside to know your good and doing the best you can. Therefore if hurtful words are thrown at you you can say that’s not the person I am, that means nothing to me what your saying, as I know myself and that’s for certain so “I’m not taking it personally” instead of a need to lash back and engage with pointless conversation, as in if you know who you are that’s what matters and confirming that to yourself and living a life to be the best person you can be then there is nothing to take personally. Some on the earth are living in their lower self instead of their higher being as they may be sadistic and into ridicule, humiliation and go out of their way to try to harm someone by revenge. Being a Scorpio I don’t let my stinger come out as I learned to rise above it and be the Scorpio that soars like the eagle and live in a higher consciousness state.